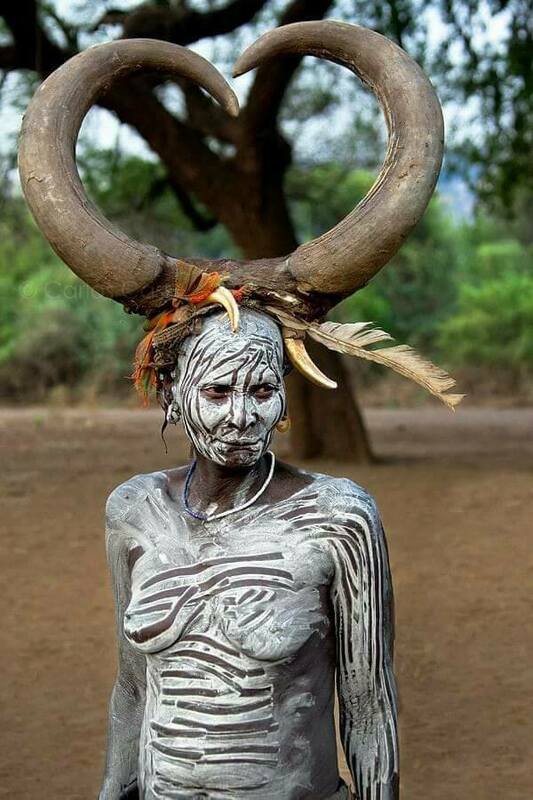 The Mursi (or Mun as they refer to themselves) are a Nilotic pastoralist ethnic group in Ethiopia. They principally reside in the Debub Omo Zone of the Southern Nations, Nationalities, and People's Region, close to the border with South Sudan and about 100 kilometers north of the Kenyan border. The Mursi undergo various rites of passage, educational or disciplinary processes. Lip plates are a well-known aspect of the Mursi and Surma, who are probably the last groups in Africa amongst whom it is still the norm for women to wear large pottery, wooden discs, or ‘plates,’ in their lower lips. Girls' lips are pierced at the age of 15 or 16. Occasionally lip plates are worn to a dance by unmarried women, and increasingly they are worn to attract tourists in order to earn some extra money. Accessories aren't limited to lip plates but other various forms of head gear such as the one below are also popular.